I'm a chocolate lover generally speaking. If presented with multiple dessert options and I can only choose one...I will almost always choose the chocolate option. But what I've come to realize is everyone else does not necessarily have the same love for chocolate that I do. Hmmmm. Perplexing. In fact one of my gal pals claims to be "racist" in the dessert world, favoring the white and light colored desserts over the chocolate and darker colored desserts. Fascinating. The truth is my dessert palette has become a little less discriminating (color wise) in the past year or so. I've come to appreciate the depth of flavor in the vanilla genre of baked goods. In the past I've turned my nose up to these types of treats thinking, bland, boring and still bland. But now I try to give them equal opportunity consideration. Vanilla is actually a complex flavor. And (begrudgingly) I will admit that I even like these fair treats. But alas, chocolate....deep dark chocolate....you always have my heart! 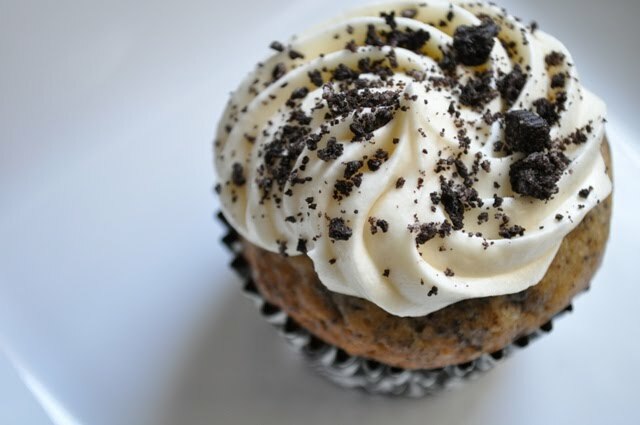 The cookies and cream cupcake attempts to be neutral in the battle of vanilla versus chocolate. But as a chocolate girl, I think they really favor the vanilla side of the coin. Despite this minor flaw, these are great cupcakes! The recipe comes from How to Eat a Cupcake blog. I did modify the frosting part of the recipe...my frosting wasn't holding any shape so I decided it needed a little cream cheese. These babies bake up almost muffin like. Almost. They are still light and cakey and moist. 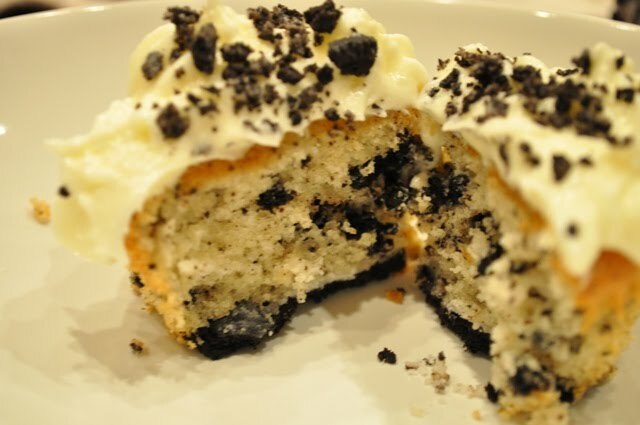 They have a half of oreo on the bottom of the cupcake (see photo below) and white cake mix with sour cream added for a moist texture. 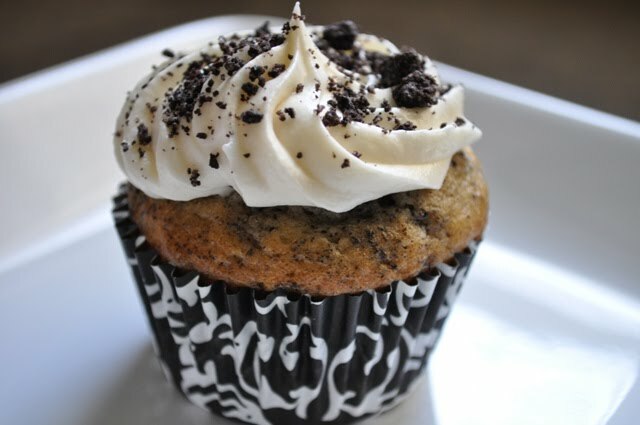 Crushed oreos are folded in and cupcake is topped with cream cheese frosting and a sprinkling of crushed oreos. Pretty dang good stuff. I made these twice in the last few weeks...once for my gal pals on our annual desert getaway trip and then again last weekend for my niece's birthday. I was worried the Peace Cake would not feed the crowd of 20 plus. Can't risk short-changing anyone on dessert in my family! The cupcakes were a success on both occasions. So if you are looking for a vanilla/chocolate neutral goodie...this might be the one for you. Looks so good! Would love to have one now! Yum! these look amazing gloria, i'm gonna have to try them! love the photos, too! I'm not a chocolate lover like you. I usually favor vanilla. 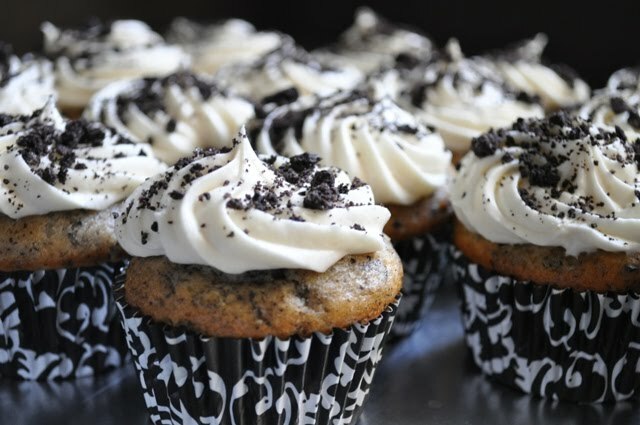 BUT I could surely go for one of these cupcakes right now.